Oversized with a wide mouth, the Klean Kanteen K40WSSL stainless steel wide mouth water bottle helps ensure you have all the clean drinking water on-hand to gulp yourself to hydration! Dishwasher safe, eco-friendly and BPA free. The perfect water bottle for long car rides or camping trips! 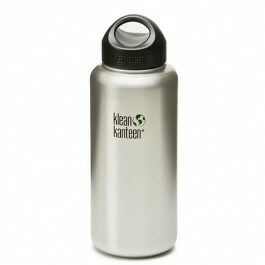 Order the 40 ounce Klean K40WSSL stainless steel wide mouth water bottle today.